In the United States, community colleges continue to serve as a critical pathway for populations underserved by selective postsecondary systems. However, the role of community colleges as democratic institutions advancing equitable outcomes is being confronted by contemporary policies which stress private returns and market-based outcomes. 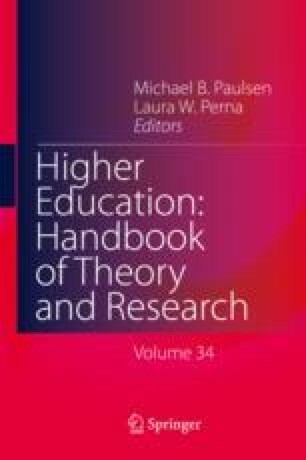 In this chapter, authors challenge this trend, (re)casting the role of community colleges as equity-centered institutions for advancing enrollment, persistence, and completion for a diverse set of learners. We explore the foundational evolution of community colleges, including the historical tensions between business interests and democratic principles; summarize key policies that shape community engagement and individual participation; and explore the threat of neoliberal forces for advancing social and economic equity at community colleges. Implications for contemporary theory and recommendations for future research are also presented. Center for Community College Student Engagement (2014). Contingent commitments: Bringing part-time faculty into focus. Austin, TX: The University of Texas at Austin. Available online at https://www.ccsse.org/docs/ptf_special_report.pdf.